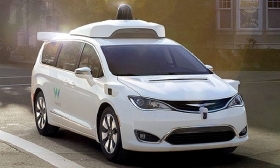 FCA produces hybrid minivans in Windsor, Ont., and ships them to Google's Waymo division, which turns them into autonomous vehicles. Canada wants North American automakers to get extra credit for making cars more environmentally friendly or able to drive themselves as negotiators try to bridge one of NAFTA’s sharpest divides. At the latest round of NAFTA talks, Canada put forward some fresh ideas on how to calculate the value of regional content in vehicles, including giving more credit for driverless and electric cars, plus research and development work, Chrystia Freeland, Canada’s Minister of Foreign Affairs, said in an interview Wednesday from Bloomberg’s headquarters in New York. “The ideas are very intentionally ideas rather than a fully baked proposal; they’re about some directions,” Freeland said. The proposals, if adopted, would promote high-skilled labour and encourage the next generation of carmaking to stay on the continent, she said. Regional content requirements -- or rules of origin -- are among the touchiest issues the countries are working through in revisiting the 24-year-old trade deal. The North American Free Trade Agreement requires a vehicle to have a certain percentage of North American content in order to benefit from tariff exemptions, and the U.S. has proposed raising the bar to 85 per cent from 62.5 per cent for a typical car. The U.S. has also called for a new requirement that 50 per cent of content come from within its borders. Canada’s auto proposals presented in Montreal didn’t include any specific numbers, Freeland said, and negotiators have said they weren’t meant to be counter-proposals to the rules of origin ratios the U.S. has put forth. Still, the U.S.’s NAFTA negotiator broadly rebuked Canada’s latest ideas. Freeland said the Canadian ideas were meant to spark conversation, and that she’s hopeful her counterparts in the U.S. and Mexico will read and consider them before talks resume Feb. 26. Canada also proposed finding ways to give credit for the use of steel and aluminum from North America and modernizing the so-called tracing list so there’s less red tape for companies trying to comply, Freeland said. She said Wednesday she acknowledges that the rules of origin are a “fiendishly complex area” and said the only way to reach a successful conclusion is for all three countries -- plus carmakers, suppliers and labour officials -- to think about the questions of regional content together.